Wondering how to start eating a Traditional Human Diet, new to Paleo, need a guide, need recipes? This 30 Day Guide to weight loss, better health and higher energy is a how-to guide with menus and recipes from Millie Barnes, a Chef and Nutrition Coach with 30 years experience helping clients lose weight, heal from allergies, learn how to eat gluten, soy and lactose free.The basis of this way of eating is a Traditional Human Diet that is low carb, delicious and meets all of your nutrient needs. Most Gluten-Free Chef’s Focus on teaching how to eat the same diet but with alternatives to the dishes that have grains that contain glutens. 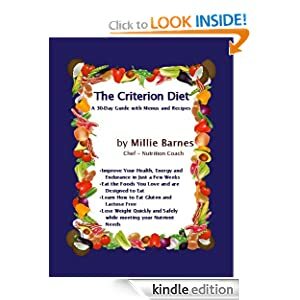 My work, and this book, focus on healing, eating correctly to meet your nutrient needs. All grains, whether they gluten or not, are almost 100% carbs, are devoid of nutrients and enzymes. Your diet should focus on healthy fats, high quality proteins and low glycemic vegetables with occasional use of grains or flours. These foods are recreational foods. This guide gives you instructions on shopping and cooking along with 30 days of menus and recipes. These menus give you 2000 calories a day, which is what you need to meet your nutrient and energy needs. When you take in enough nutrients and calories you move the body out of starvation mode and allow it to begin shedding fat and toxins. The improvement in health occurs quickly and in no more than one to two weeks you will have substantially more energy!